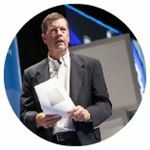 Unlike most people who become involved in high technology industries, Scott McNealy did not come from the world of amateur programmers, hackers, and computer scientists. Instead, his background was in business, having earned a Bachelor of Arts in economics from Harvard and an MBA from the Stanford Graduate School of Business. While at Cranbrook, his father was in the automotive industry as the vice chairman of the American Motors Corporation; most of his work experience prior to joining Sun was in automotive manufacturing. Sun Microsystems, along with companies such as Apple Inc., Silicon Graphics, 3Com, and Oracle Corporation, was part of a wave of successful startup companies in California's Silicon Valley during the early and mid-1980s. McNealy started out working at his father's company, American Motors and later became manufacturing director at Onyx Systems, a vendor of microprocessor-based Unix systems. In 1982, he was approached by fellow Stanford alumnus Vinod Khosla to help provide the necessary organizational and business leadership for Sun. The name "Sun" was derived from Andy Bechtolsheim's original SUN (Stanford University Network) computer project, the SUN workstation. In 1984, McNealy took over the CEO role from Khosla, who would ultimately leave the company in 1985. On April 24, 2006, McNealy stepped down as CEO after serving in that position for 22 years, and turned the job over to Jonathan Schwartz. McNealy is one of the few CEOs of a major corporation to have had a tenure of over twenty years. According to the book The Decline and Fall of Nokia, Scott McNealy was the "dream candidate" to become CEO of Nokia in 2010. However, McNealy said he was not offered the job. In 2010, the same year Oracle Corporation purchased Sun Microsystems, the company McNealy co-founded decades earlier, he co-founded a social media intelligence company called Wayin. The new venture was not widely covered in the media — unfortunately, the day he invited reporters to his home to launch Wayin, was the same day the co-founder of Apple, Steve Jobs, died. Wayin sought out and merged with EngageSciences in 2016, to acquire senior staff, and diversify their market. Their product is an application store for brands to self-publish interactive advertising campaigns using reusable digital assets, removing the bulk of cost involved in delivering multi-channel digital advertising.